The development of therapy-related myelodysplasia (t-MDS) and acute myelogenous leukemia (t-AML) has been increasingly recognized as an important problem following high-dose chemotherapy and autologous hematopoietic stem cell transplantation (AHSCT) ([Stone et al., 1994]; [Deeg et al. 1998]; [Pedersen-Bjergaard et al., 2000]). The significance of this issue is better appreciated in light of the expanding indications for AHSCT early in the treatment course along with its limited related mortality. 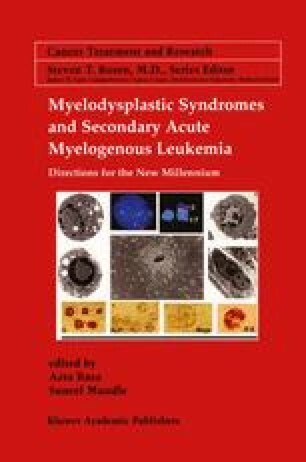 Any discussion of t-MDS/AML complicating AHSCT should take into account the contribution of chemotherapy, especially with alkylating agents, administered prior to transplantation and the difficulty of establishing the diagnosis solely on morphologic grounds. Several reports over the last 10 years, have extensively discussed many aspects of t-MDS/AML, such as origin of the disease, risk factors, cytogenetic abnormalities and available therapeutic options. However, important questions especially regarding the relative contribution of prior chemotherapy, the extent to which total body irradiation (TBI) increases the risk of t-MDS/AML, and the significance of MDS-related chromosomal changes in the absence of bone marrow dysplasia still remain.